Hey everyone! I hope that you all had a wonderful weekend. As for me, my weekend is over but for our friends on the other side of the world it is still Sunday! Apologies for the slightly delayed post as I was a little sick again over the weekend again. Oh the usual, bouts of nausea and vomiting...I am really so ready for all this to be over!! Anyway, so here I am to share some posts which caught my attention over the weekend! If you enjoyed them as much as I did, please do give them a generous upvote and resteem! @foxyspirit shares about the horrible "Momo Challenge" that is circulating around the world and affecting children. One little girl in Argentina actually died from taking the harmful challenges that Momo suggested. Your child could be watching an innocent youtube video cartoon when Momo will suddenly pop up. Honestly even when I look at the picture of Momo, as an adult it creeps be out too. Can't imagine what it does to the kids. @foxyspirit challenges us to be more present and informed parents. On top of that to always be on guard and remember that as parents we could do more to protect our children. The internet is a vast place of good, bad and the ugly. It is a good time now to take stock of what you are doing to help protect our beloved children. @frejafri is one of our super talented Mama artists. She entered this post for @ntopaz and @veryspider 's Childhood Memories Illustration Contest. I love the illustration as I also remember playing on the swing as a child. She used a photo of her son as inspiration but she relives her own many childhood memories of sitting on a swing. She also does logo designs and other beautiful illustrations. Recently she helped the @homesteaderscoop to design their new logo! Her post title roughly translates to "Two days and one night in Singapore" Please do forgive translation blunders as I am banana through and through. I am only now learning to read and write Chinese but I am far from being able to read and translate Chinese characters to English. So Google Translate it was. Our mama @elizacheng recently visited Singapore for work and of course food brings everyone together. She met up with Steemians over there and bonded over Thai food in this post. If you are in Singapore and itching for good Thai food, she recommends Diandin Leluk at the Golden Mile Complex! We have Mamas from all over the world and our diversity is refreshing! So I decided to share another one of our Mamas from Indonesia who write mostly in Bahasa Indonesia and in this post, she shares about the power of community and togetherness. Just like being on Steemit, the power is in the diverse communities. Unity in Diversity: Although different, but still one. As she spends some idle time with her little daughter preparing for an upcoming 3-year-old birthday party , she reminisces the exact same night 3 years ago when she gave birth. She then tells the story to her little girl that just before dawn, she was pushed out into the world. Bringing life into the world is such a significant event for us mothers that we all have our own story to tell. 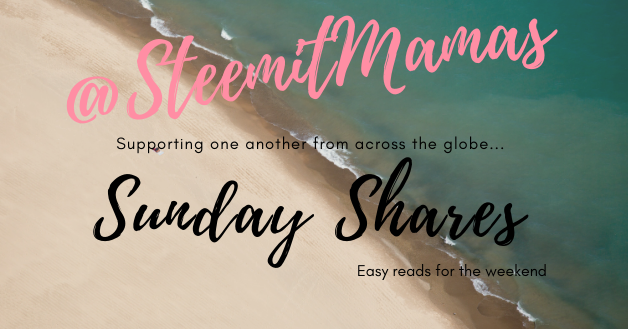 Thank you for reading and that wraps our Steemitmamas Sunday Shares for this week! Do check out their blogs and show them some love and support by upvoting and resteeming if you feel the same! All the Mamas here will receive a 100% upvote and a resteem from the @steemitmamas community account for one week. On top of that, I will be sponsoring 1 SBI for a lifetime of votes to one lucky Mama who will be chosen via a random name picker from all the posts that was featured in our Weekly Sunday Shares! Readers you have an opportunity to win 1 SBI as well! Just comment on this post what you liked about the posts that was shared and you will be entered into the draw. The winner will be picked via a random name picker as well. Are you a mom, expecting mom, stepmom, an adoptive mom or grandma? If so we’d love to have you join us! We’re a Fun Lovin’ Supportive group of Mamas sharing our everyday victories and trials as we live this thing called Life. Please click on the banner below to join us on Discord! Very good selections! I need to catch up on a few! I am really enjoying these Sunday reads! Thanks @khimgoh! Thanks @crosheille you have a great week ahead!